It’s a brisk but sunny Friday morning as students dressed in black and blue make their way to Dibden Center for the Performing Arts, carrying their hot teas close to their faces and clutching their folders to their chests. Girls are tripping over their skirts and boys are hurriedly straightening their ties as they make their way into the building, supposedly performance ready. Although they are still groggy and less than enthused to have to perform so early in the morning, the show must go on: that is, the seventh annual NVU-J Performing Arts Festival. This event invites a number of high school performing arts students in the area to learn from professors and majoring students. They participate in workshops all day then come together to put together a final product to showcase at the end. This year, NVU-Johnson hosted the Hazen Union, Springfield, Milton, Burlington, and White River Valley High Schools, as well as People’s Academy on Friday, Oct.19. Visitors also got to see performances by some of the current groups on campus during the NVU-J Performing Arts Student Showcase, which was held first thing in the morning. After some opening remarks, the choir sang “This is Me” from “The Greatest Showman” to start things off and set the mood for the day. This was followed by a mesmerizing performance by Con Temp, a group of students led by Assistant Professor of Performing Arts Dr. Justin Rito. This ensemble performed improvisational pieces that opened audience’s minds to new ways to think about music. a premiere of “Mr. Burns” by the Performing Arts department. They performed a scene from the end of act two and gave a general summary of the play. This part of the morning culminated in two dance routines performed by members of the dance club to promote their “Danceland” event coming up in December. After the performances, students were split up to have sessions of group activities and workshops throughout the day. These activities ranged from team building and getting to know each other to learning new skills that they would use in the Closing Session Performance. “We did a workshop on building a scene that represents happiness and then we build a soundscape based on fear and I thought that that was really fun because you get to watch other people’s interpretation of it and have your own interpretation of it,” said Olie Grant from Hazen-Union High School, about her favorite workshop of the day. The event has other purposes as well, one being to promote the arts at NVU-Johnson as well as the campus itself. Kevin Coen, an English teacher at Springfield High School, encourages students to come to this event, if for nothing more than a free tour. She says that it’s helped her to start thinking about what she may want to do and what opportunities she would have available to her at NVU- Johnson. 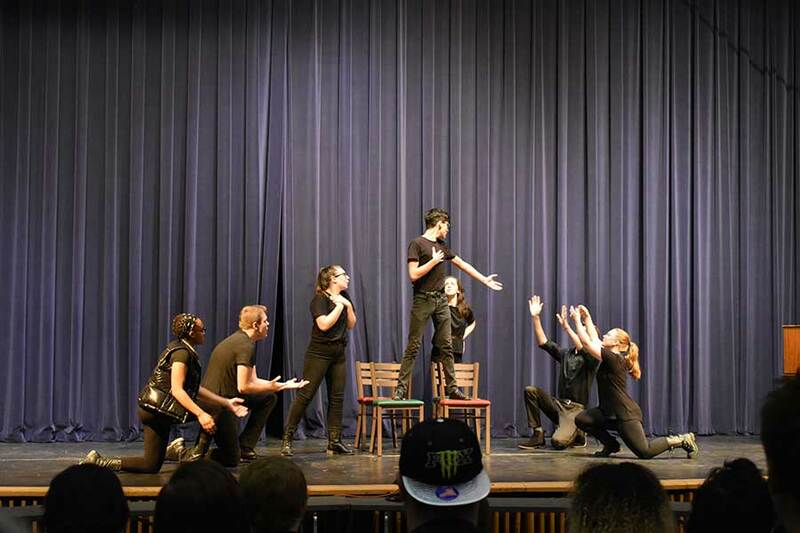 Johnson’s Performing Arts Festival differs from other festivals because the high school students get to work with actual college students throughout the day, which helps them feel more comfortable about pursuing performance in the future, no matter where they decide to go. “There’s an energy that comes from working side by side with people who are five years later in their artistic growth process that’s pretty exciting. And that’s something that we do that’s kind of unique,” says Assistant Professor of Performing Arts Bethany Plissey, who added that students have a chance to see themselves in the group and see where they may fit in when they get to college, which is a big concern when making the transition into a collegiate setting. “I think it’s special for the student, to think about not necessarily envisioning themselves at NVU but envisioning themselves as a college student, and as a college student artist and what that would be like,” says Plissey. Unfortunately, not as many high school students had the opportunity to participate this year, due to a scheduling conflict. Fortunately, the event was able to be modified for a smaller group. Traditionally, the festival is held on the last Friday of October, but this year it was moved up a week because another Johnson open house event was scheduled to happen that weekend as well, and the Admissions Office did not want to spread themselves too thin. “There were four definite schools that have come in the past that couldn’t because their schools aren’t meeting today,” says Plissey. Some students from those schools, however, came on their own to participate in the festival, even though the rest of their groups could not make it. Overall, the festival was a success. Students left talking about the day and trading contact information with new friends, and picked up some NVU Johnson t-shirts on their way out the door. Many expressed their positive feedback about the day, and how they felt more comfortable about the idea of college and college-level performing arts, no matter where they go.